Natural Food Certifiers and Non-GMO Project now available for food manufacturers wanting to achieve non-GMO certification status. Up until April 1, there was only one organization known for certifying that food products did not contain any genetically modified organisms (GMOs). But in April 2013, a second one has appeared. The Non-GMO Project, Bellingham, Wash., has been certifying products as non-GMO since 2008. It bills itself as "a non-profit organization committed to preserving and building sources of non-GMO products, educating consumers, and providing verified non-GMO choices." "The project began as an initiative of independent natural foods retailers who were interested in providing their customers with more information regarding the GMO risk of their products," its website explains. "As the project evolved, it became clear that in order for the initial vision of standardized labeling to be possible, a third-party verification program was needed that would identify products compliant with a uniform, consensus-based definition of non-GMO. "With the help of technical consultants FoodChain Global Advisors, and fueled by the passion of a dynamic array of industry leaders, the Non-GMO Project has successfully created a collaborative non-GMO verification program that began enrolling products in the fall of 2008. Working at every level of the supply chain, all the way back to the seeds, the project's role is to inspire and ensure viable non-GMO alternatives long into the future." Non-GMO Project's website includes an area to search for non-GMO products by product category, brand or specific product. And it offers an iPhone app for finding non-GMO products while consumers are at the grocery store. For food processors, the certification process is laborious and time-consuming, and there reportedly is a backlog. Perhaps that's why another certifier has announced itself. Natural Food Certifiers, Spring Valley, N.Y., already offers certification programs for USDA Organic, Kosher (under the Apple K label), vegan and gluten-free. "The GMO Guard Program is a logical extension of the programs that NFC already offers, and one that is so timely and sought-after in the natural and organic food market today," says NFC Director Rabbi Reuven Flamer. In order to assess a new product for GMO Guard verification, NFC performs an intake -- commitment and cost free — to analyze the product and will then advise clients of the next steps and costs to obtaining a seal. 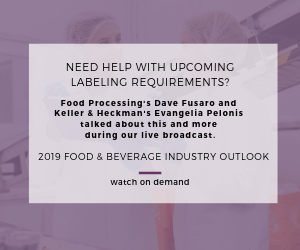 The process may include, but is not limited to, a request and review of the ingredient deck including country of origin and certificate of analysis, as well as inspection of manufacturing facilities. Leading natural and organic products retailers such as Whole Foods Market are seeing growing demand for products that don't use genetically engineered ingredients, Flamer points out. Products that have a non-GMO assurance seal are seeing sales increases of 15-30 percent, according to Whole Foods Market President A.C. Gallo, according to Flamer. NFC is offering special rates to new and existing customers, who can easily add the NFC GMO Guard Verification Program to their existing NFC certification programs for their products.